Pigs are prey species, and one of the ways that they escape from predators is with their speed. All varieties of pig -- wild and domestic -- are surprisingly fast. They can outrun you in just a few seconds. Many American fairs featuring livestock exhibitions have greased pig catching contests. The impossibility of getting hold of such a slippery creature even gave rise to such expressions as "slicker than a greased pig." Pigs are sprinters and can attain their top speed in just a few strides. Most of their predators are sprinters, too. Unfortunately for the pig, dogs and people riding horses can eventually run down an exhausted wild boar or domestic pig. Wild boars were eventually hunted to extinction in many places. Domestic pigs average a top speed of about 11 miles per hour. 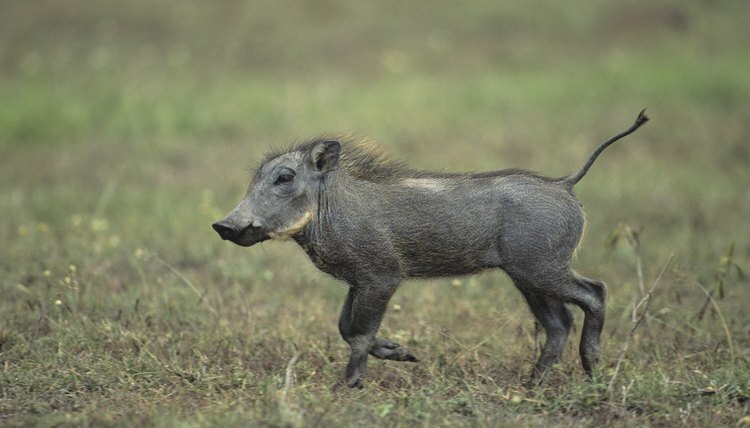 A wild boar, which isn't as fat-laden as a domestic pig, can reach speeds up to 15 miles per hour. Pigs don't usually run in a straight line. They often zigzag in order to escape enemies. If you are chasing a running pig, stop and save your strength. Wait for the pig to tire out. Pig speed is very hard to clock because pigs usually will not run in a straight line. Although pigs can be trained to run a short race course, most pigs will not cooperate in running a path in order for their speeds to be clocked. Pig racing is becoming a big attraction at many outdoor events. The race is for a few piglets, who run a round, narrow course and often try to jump obstacles, although they usually just knock them over. Greased pig catching is falling out of favor with the general public due to injuries to pigs and people. These races are banned in several states.